It's funny, because I agree with all that has been written, but from the opposite point of view. 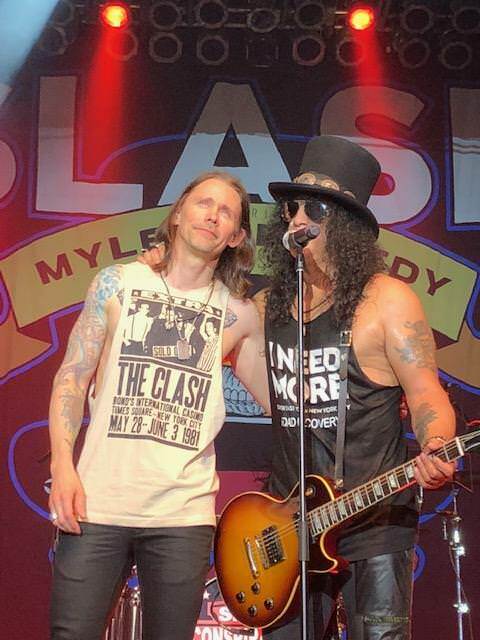 I think AB is taking time from the Myles stuff I REALLY want to hear, namely his work with Slash and his solo stuff. I would SOOOOOOOOOOOO much rather hear "The Next Year Of The Tiger" (or "The Year of the Rabbit"?) than anything AB is going to put out. You, my friend, are a weirdo. I have never disagreed more with anything you've said... Did I wake up as Adami and not realize it? Boo! Boo to you sir! I'm so sorry; Mark Tremonti is good, but he's not at Slash's level if you're asking me. I saw the Slash/Myles show a couple weeks ago from the second row, and I had the feeling all night long that I was watching one of the truly greats. Well, you're not necessarily wrong about Slash... Only in regards relative to Tremonti. I saw Slash and Myles 6 years ago and it was amazing (true MK fanboy). But seeing AB 7 times in the last 14 years has informed me that if you want to have that "I was watching one of the truly greats" feeling again, then give in and see AB live. For what it's worth, I took it to my brother who is a terrific/knowledgeable guitarist who's been playing for about 20 years: "Mark BY FAR. He is a real student of the guitar. 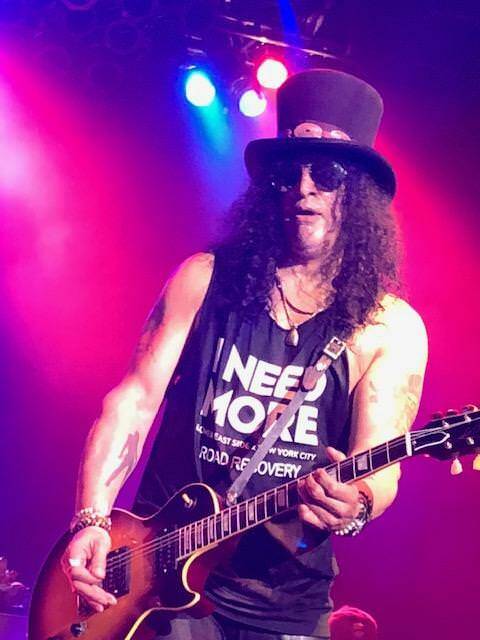 Slash is great but a little one dimensional." Respectfully disagree. Mark Tremonti > Slash. It's the weirdest thing. I love A Dying Machine. I love Year of the Tiger, but I just can't finish listening to Living the Dream in full and that was the first album that Myles was a part of that I cannot listen all the way through. Slash is a guitar legend, no doubt about it. The songs he's done in the bands he's been a part of for 30 years speaks for themselves. That stated, I just don't enjoy Slash's Aerosmith-influences/80s hard rock vibe (that sorta of sound I feel can become just as dated and generic just like modern hard rock can be generic and uninspiring) as much as Mark Tremonti's modern hard rock/heavy metal sound and that I feel like Mark and Myles is such a well-oiled machine in the guitar/songwriting front. Which is why I always will be an Alter Bridge fan first above being a Myles Kennedy fan and a Mark Tremonti fan. No doubt about that. Yeah, everyone has their own preferences, which is cool. Stads is on record here many times expressing his love of Slash + Myles over AB. It's all good, I personally prefer AB, but it's all tastes. I think my larger point is that before the AB guys started doing other projects, there seemed to be more thought and intent to their music. Even though I LOVE all their records, I still don't see them ever topping Blackbird while AB is only one ball they are juggling, trying to keep up in the air. In order to write and perform another record of that caliber, I feel like AB would have to be their sole focus. I may be completely wrong, but that's how I feel. By the way, for the record, I actually rank the post-BB albums pretty well in the catalog. So it's not that I think the post-BB albums are bad, they aren't. They are fantastic. I'm just not sure they'll ever top it if their focus is constantly shifting. This is also to Sylvan: you both hit on it perfectly: I grew up on Aerosmith and Led Zeppelin (Aerosmith owe a LOT to the Yardbirds, Page's group before Zep) so that's in my DNA. Slash has even told the story about going over to a girl's house as a teenager, hoping to get some action, and she put on Aerosmith Rocks, and he ignored her to listen to the music! I SOOOO prefer that to that modern hard rock sound, which to me sounds so processed and generic to me (not Tremonti, but generally). But look, it's not a competition, and they can BOTH be good (I mean, there's something to be said that Myles is working, repeatedly, with both; not that he is a god or anything, but he's one of the best and I don't think he'd hitch his star to a sub-par wagon). Although I'm not big on arena rock shows these days, I'd go see Alter Bridge; it's not like I hate them. I have about half the catalogue, and will eventually fill in the rest. The thing is, though, Alter Bridge is not an arena rock band (except in the UK and certain parts of Europe, but even some people there feel like they are best suited in music halls and theaters and House of Blues). They mainly play venues that's a slightly lower tier than the venues Slash/Myles/Conspirators plays in. Say if Slash and Co plays Hollywood Palladium in LA that holds 3,500 people, AB is playing the Wiltern Theater that holds around 1,800 people. Which is great for me as a fan, since if AB comes back to LA, I can have the chance to see them upclose in GA and don't have to pay around $100 to have that chance. I can probably pay half of that, unlike a show for a certain band that announced their tour dates this week..... (I know it's not DT that choose these prices, but man, those floor tickets for those shows are expensive). Are you serious? Wow. I've already said I'd gladly go, and this just ups that probability by a long shot. I saw Myles and Slash in a 1,500 seat (well, no seats) theater in Long Island and I'd ABSOLUTELY see Alter Bridge there. That's kind of my thing now. I've seen 325 concerts, plus minus, and at this point the idea of sitting across a hockey rink to hear tinny metal just doesn't appeal. But if I can get up close, in a small-ish place to see guys that can really play, I'm in. >>>>And its not that I find TLH or ODR to be bad at all. Far from it. Its just hard to top the consistency of Blackbird. It's funny about AB III. Outside of the Blackbird album, it has, generally speaking, the largest amount of songs among my top AB songs (Words Darker, Show Me a Sign, Slip to the Void, Isolation, Coeur d'Alene), but because the rest fall off in quality so sharply, the album dips down on the list. Its weird, because I think other than the title track, AB has written much better songs than the songs on BB since its release, but they've never been as consistent (I think we're both on the same page there), and its really a shame that they can't seem to write their most consistent masterpiece for whatever reason. Its like every record has a good chunk that is jaw-droppingly awesome, then a couple good songs, and then some formulaic album filler. And I guess thats what most record are, but I think AB is capable of much, much more. I had high hopes for TLH to do that, particularly since it followed a theme. But it never really got there, at least not for me. It was more consistent, but not consistent in terms of "wow, this is amazing." More like, "this is good all the way through, but some of it bleeds together." I really had to work at it for a bit to appreciate it more. And even today, it is easy for me to pick out the top tracks of mine from that record - Cradle to the Grave, Show Me a Leader, My Champion. Then there are a few I like, but not as much. The rest....all sort of bleed together. And if thats just the way it is going to be, that's fine, I mean AB is my favorite band these days (with Fates Warning running a close second), so it obviously doesn't bother me much and I am nitpicking. But I'd really like them to change up the way they write together and just invest that time to let things sit for a bit. But they don't really give it that time. They carve out a time, and then do it within that time. Business is business, and time is money, and I GET it. I just think throwing a curveball to the process is necessary once in awhile to make sure things don't get too repetitive. Stads -- you'll dig AB live in a GA setting. Well, ‘Blackbird’ I feel is by far their masterpiece (the song), in fact I genuinely think it should stand alongside the Stairway to Heavens and Hotel Californias, but maybe that’s just me. All are good albums, but TLH is last because the sound hurts my ears. They went overboard with the compression and there’s something about the crash cymbal that’s just way too harsh. Anyone else have this problem? Music-wise I think the album is pretty great. TLH is compressed to hell, and it really bothers me. Everything is so washed out. I also think Blackbird (the song) is their masterpiece song, but what I meant by their masterpiece was their ALBUM masterpiece. Their defining record. With each record, I hear them getting better and better together, but the albums themselves still aren't (at least for me) masterpiece quality from top to bottom. I think they will get there, but again, their whole process may need a shakeup to do so. Who knows. I love this band regardless. I just want them to continue growing and trying new things. I am not a huge fan of keyboards, except when used for atmosphere. But I keep thinking to myself that given the success with the orchestra, a record that has some keyboards in there for color and atmosphere would be something different and cool for them, and I'm hoping it happens. Yeah TLH has way to many layers and is overly compressed, but the songs are so strong. THe songs are more consistent, but not quite what I am hoping for them to achieve. But I wonder if they were allowed to breathe, if that would have made all the difference. Again, fingers crossed they notice it too, and change it up. All right, so Mark Morton of Lamb Of God is doing a solo album with various rock/metal vocalists (Jacoby Shaddix of Papa Roach, Linkin Park's Chester Bennington (the last thing he has ever recorded before he passed away), and he got his bandmate Randy Blythe to provide vocals.) Myles did vocals for a song for this album as well. It's called Save Defiance. I think this is an AB-sounding song. It has that that 00s post-grunge/alternative metal elements with some modern heavier elements (that AB has been incorporating in their later albums) to it. That stated, it is on the blandish side, not as creative to build the suspense in the bridge parts like an AB song (that's one of their stronger and somewhat unlooked points to me) and, obviously, no Mark Tremonti on lead guitar and bust a solo to really do the style proper. That stated, I like this kind of formulaic kind of modern rock in comparison to what I perceive is formulaic stuff that he did with Slash's latest album. It's a solid track, but I don't think I would want to revisit this again too often in comparison to something like the song Black & White (the track he did with Whitfield Richards & Lee Crane). 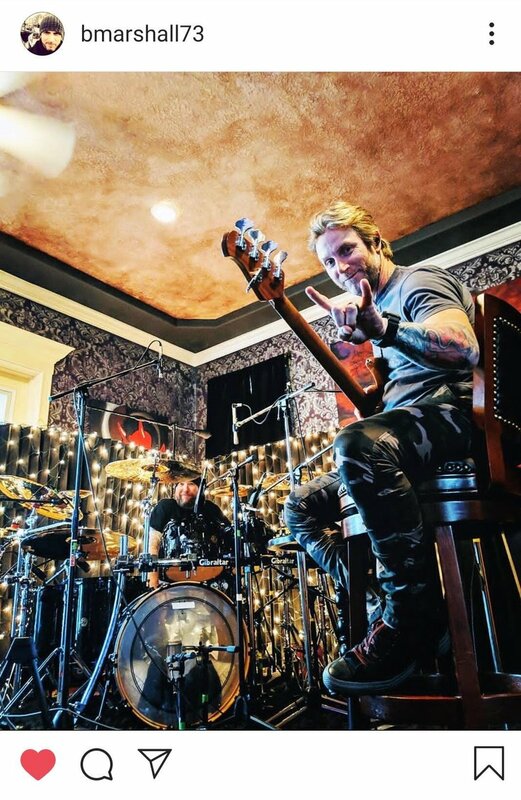 Also, in other AB news, band's hitting the studio around late March or so to finally get cracking on AB VI after Mark and Myles is done with their respective tours with their other bands. Album is highly expected to be out in the Fall as always. I mentioned this in the concerts thread, but AB is doing a VIP album listening party in Orlando for $250.00 where you get to hear the new album before it is out, meet the band, and see a brief live performance. I haven't traveled out of state in about 20 years, but I bought the pass for this and is something I feel like it is worth traveling out of the state for. I was willing to spend around $2,000-3,000 for the flight, a couple days stay, and tickets to see AB play at the Royal Albert Hall in 2017, but I didn't have the money. I am not letting something like this slip my grasp. I would not do this for any other band except Alter Bridge. Sounds like fun. My family and I decided we're always doing the VIP with Alter Bridge. We all go, enjoy the show, etc. There's something real and genuine about the band, and we all feel we get a lot out of it. We travel a little depending on the time of year, but on average, we go to two or three shows on a tour cycle. That listening party would be fun to attend. Not feasible for us as a family (that's a big trip), but I'd totally do it if I was by myself. Can't wait for the new album. I really wished they went with someone other then Elvis, but such is life. The mastering has to improve though. Their songs need to breathe a little bit more. I really enjoy The Last Hero, but everything sounds so loud. The songs lose a lot of character. After hearing the new DT record, I wish AB would go back to Ben Gross for the mix (he did ODR). With you. I just want them to do a record with SOMEONE else, ya know? Oh yea, I know. I'm with you. All right, the whole gang is here to create AB VI. Let us get pumped. From AB's Twitter. Why is Steven Wilson there? Any word if Baskette is producing/mixing this one? Hopefully they'll go in a different direction (I doubt it though). He is. Same as before. I am still excited. They have gotten more progressive with each record. My hope is that they continue to expand their sound a bit, incorporating a bit of that acoustic guitar. I'm not saying lets go Led Zep III or anything, but really sort of change things up during songs. Either way, extremely excited for a new album and tour. No idea where else to put this (feel free to delete it I guess) and didn't want to start a whole new thread, but Scott Stapp just released a new song, and it's surprisingly not bad. My hope is that they continue to expand their sound a bit, incorporating a bit of that acoustic guitar. I'm not saying lets go Led Zep III or anything, but really sort of change things up during songs. Either way, extremely excited for a new album and tour. I agree with this. The production of The Last Hero is punishing to my ears. It would be cool to hear more light and shade on this next one. Indeed. Between the last few AB albums and his solo albums, I feel like Tremonti has pushed HEAVY as far as he can go. Would be cool to go away from all the heavy stuff. Leave it for the solo albums, and live will have tons of older songs that are really heavy. They really need some diversity beyond 20 seconds in one song of classical guitar. Yeah, totally agree. I've been pushing since BB for them to continue to lean to more progressive styles (meaning more diversity and variety in the music). I'll third that one. 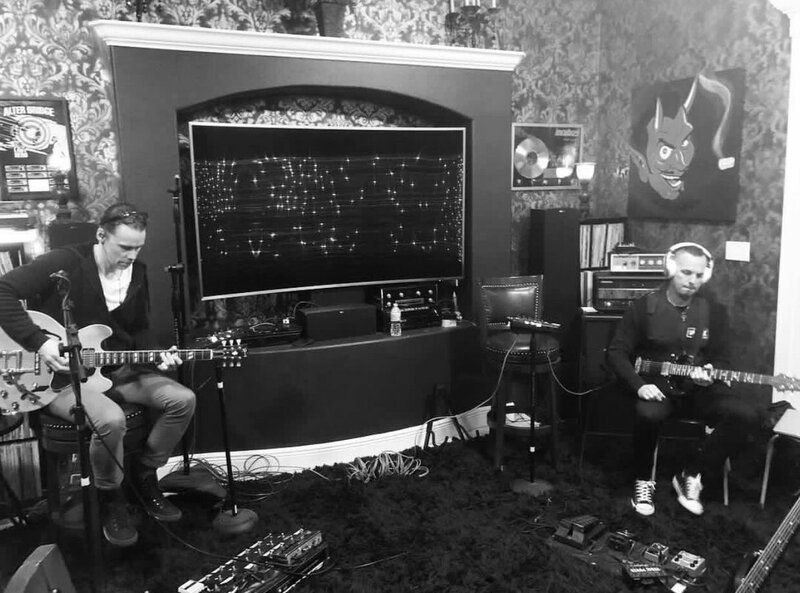 I honestly wish they'd throw in some more acoustics, and even (and this is crazy, given I am not a fan of them generally) some keys to prog it up, and for mood. They do a good job straddling that balance between technicality/atmospheric/modern hard rock, but the HEAVY is as HEAVY as I think it can go, at least with the rhythm guitars. I'd like to see Myles and Mark really stretch their guitar playing a little bit and do some more complex trade-off and harmonized soloing. But when I talked to Mark, he said while its cool, they also are cognizant that they aren't in that 80s era. So its really more of a touch of it here and there. Can't wait for AB VI though! I've been a very reluctant traveler on the Alter Bridge train so far. I feel like it's so much talent wasted. Well, not WASTED, but not tapped into as deeply as it could be. I MUCH prefer Myles solo and with Slash (I LOVE his work with Slash) and it always seems like I SHOULD love AB and just, barely, like it. I think if they did go epic - basically, the closer they move to the format of Zeppelin (Light/dark, keyboard flourishes, acoustic numbers, oddball song structures) - I think the more I'm going to be on board. I'm just not into that - I don't know what it's called; it's not "nu metal", but maybe I'll call it "nu heavy" - that Tremonti plays so much. I know you know what I mean, I just don't have a word for it. That chugging, dropped E-string growly riff that seems to crop up 8, 10 times a record. 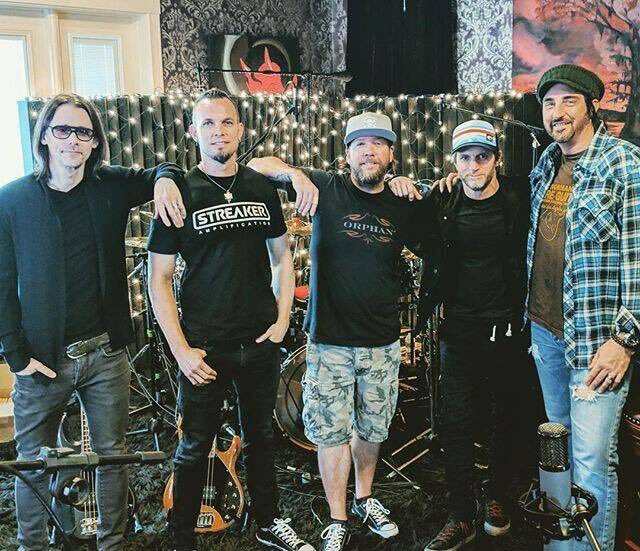 In more serious AB studio news, Michael Tremonti (Mark's brother and head PR guy) stated that they got 14 songs ready to be recorded and Flip begins tracking drums in a few days. In lighter AB studio news, in a rare social media post from Flip, here's Myles on the drums. That's awesome, Myles is such a good dude. Can't wait. I also saw Mark was writing solos the other day and posted a picture of his guitar/amp combo he was using. Quite excited to hear what they've come up with this time. Part of me would like to see them tackle a full concept. They've dabbled a bit with themes on AB III and TLH, and Mark just finished doing a concept album with his solo band, so it'd be cool to see AB go for it.